Spacious Remodeled Two Bedroom, Minutes from the Beach! Although the Pier is nearly the same sq. 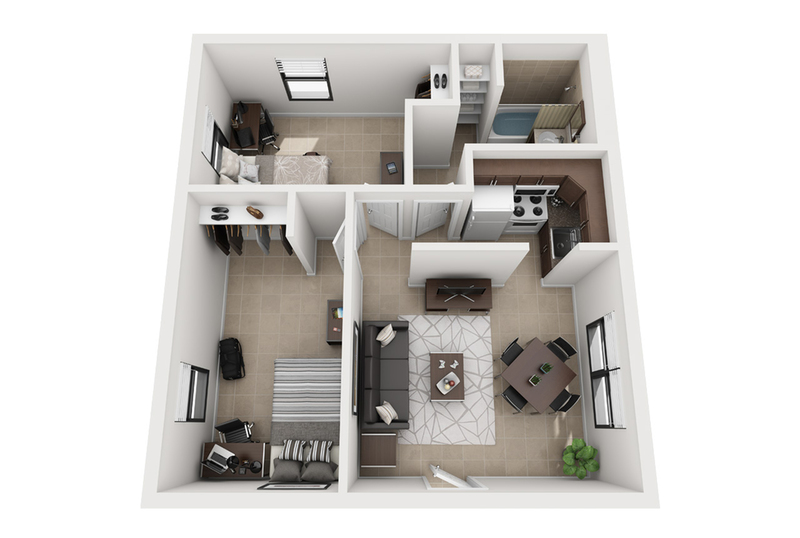 ft. as the Seaside floor plan, you will see a vastly different layout! In this floor plan, the space is designed around the living and dining areas with slightly smaller bedrooms. This floor plan also offers one of the largest bathrooms. Perfect for residents who love to entertain and spend their time with friends and family! Each apartment offers a newly remodeled dwelling featuring new energy efficient appliances, java cabinets, granite counter-tops, tile flooring and upgraded bathrooms for an overall modern aesthetic. Apartments include water and trash. Call Jade today to schedule an appointment to view this spectacular one bedroom. Nestled in the very heart of downtown Naples, Jade boasts an incomparable location with convenient accessibility to all that the city has to offer. Revel in new and upcoming restaurants, shops, art & entertainment and world-renowned beaches. Jade is a pedestrian friendly community just steps away from 5th Avenue South, Naples Community Hospital and the River Park Community Center which includes a basketball court, pool and fitness center.